Henry (5), Herman (6), Charles (12), Daniel (3) and Caroline (1)--children of Jacob and Caroline KOWITZ died between the 4th and 20th of October that year. Oh my, five kids in one family had to break the Kowitz' hearts, and spirits. According to the 1885 census, 3 Kowitz children survived (Julius, Louisa and Mary), and happily, another child, Christina, was born in 1885. According to an article in Minnesota History Magazine that Larry found, a family named Hanson lost five children in Sleepy Eye four years earlier: " It was a sad sight to see Hanson driving up the road every day or two on his way to the cemetery, alone with his dead. The children died between August 26 and September 5. There were no funeral services or processions for the little ones—just simple interments with little or no ceremony". This would be true all over the state--and it's why there are no monuments in the cemetery with their names. The John Jansons, above, had just arrived from Germany that spring. They'd traveled with the Joseph Janson family, my great-grandparents. The baby who died, Frances, was born in Buckman, but little August had made it all the way across the ocean, only to die of a horrible disease over here. JP Sand was great-grandpa Mike Sand's brother. We've written about him on HH because he became a Morrison Co sheriff's deputy. There are no family stories about the devastation of having children die so young. 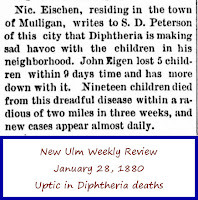 I suspect it had something to do with the "scientific" attitude at the time: some authorities thought diphtheria was caused by unsanitary conditions. 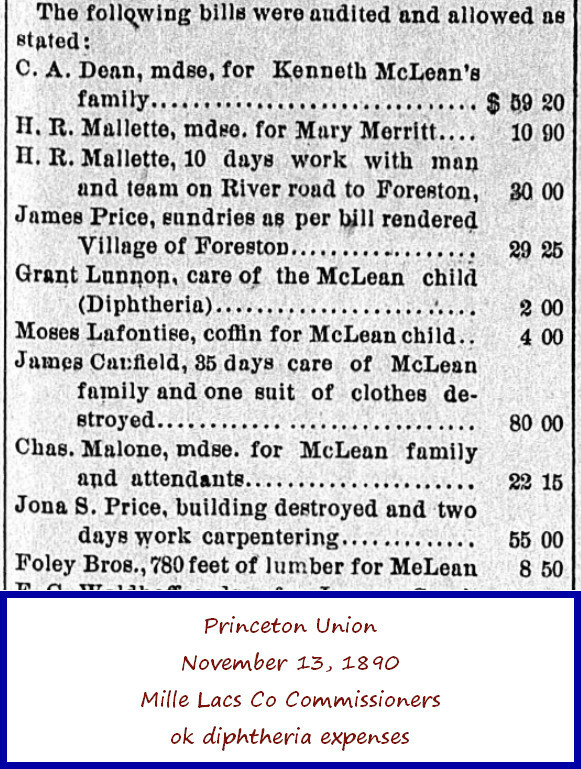 That article from the St Paul Globe newspaper, February 1881, uses words like filth and squalor, so besides loosing beloved babies and children, there would have been a pall cast on their home and its housekeeping. But then, as Larry added, maybe it was too horrible to remember, and simply couldn't be.. 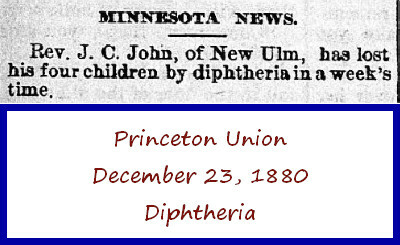 The first few Minnesota newspapers reporting diphtheria deaths were in 1879 or so. 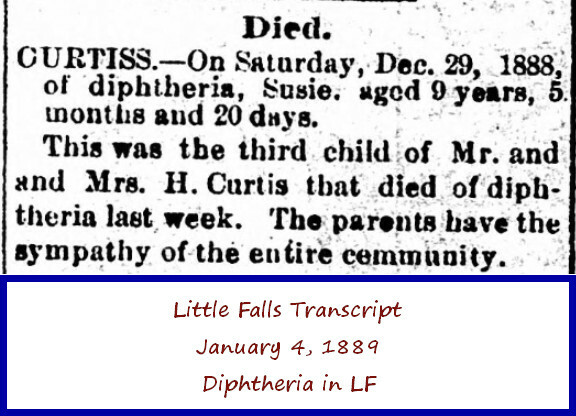 By 1882, newspaper articles were definite about isolating and quarantining anyone with diphtheria. Schools and churches were closed, and public funerals could not be held, meaning mourners couldn't come to the house of the victim, where they would traditionally have been laid out. 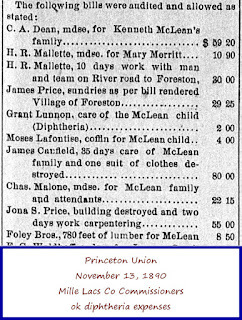 Early on, a paper would report local deaths, but later, it seemed only deaths in towns 50 miles away were mentioned. I didn't find mention of any of the Buckman deaths, but the Library of Congress doesn't have every newspaper. Next day: Larry found an article from the Fergus Falls Daily Journal, dated August 20, 1969 (Google has newspapers, too!) about a forgotten cemetery where a few diphtheria epidemic victims were buried in 1883. Such a sorrowful place...I hope it's been restored. 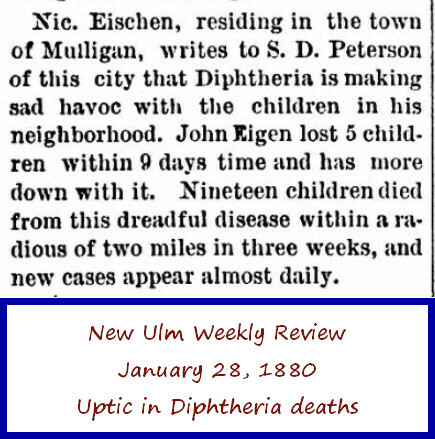 BTW, other stats I found in my research--Minnesota recorded 460 deaths from Diphtheria in 1879 alone, and Princeton closed all schools because there was one case in town. If only other towns had done the same. Thank you to John L from Larry & me!